Souriau 8STA power connectors can handle all the power and environmental issues found in motorsport. With corrosion resistant aluminium alloy shells, they can accept many wire sizes, are rated to IP67 and can incorporate contacts that can deal with up to 200A. These 8STA power contacts can handle up to 200A continuous for even the most demanding motorsport power applications including batteries, alternators and starter motors. By combining a mix of contact and wire sizes, space and cost saving is assured while easy visual wire identification speeds installation. This is the most popular 8STA Series size for connecting batteries, alternators and starter motors. 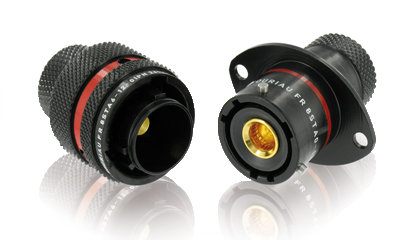 Available in 5 aluminium alloy shell styles plated in conductive black zinc or nickel, these circular connectors are rated to IP67 and feature contacts rated up to 200A (High Power).